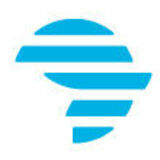 Free State Development Corporation (FDC) Driving enterprise development and investment in South Africa’s most central province, the Free State. SMME/co-operative funding and support The FDC provides products and services to SMMEs and co-operatives in the form of financial support (business loans) as well as business development support (facilitating training and mentoring service providers). The principal loan products offered to Free State entrepreneurs by the FDC are: •	Start-up loans for recently established businesses that are mainly at formative stages. •	Expansion loans offering viable and existing businesses the capital needed to expand. •	Business take-over finance to assist potential clients to acquire a business as a going concern. •	Bridging finance for SMMEs with short-term cashflow problems with contracts or tenders. Export-related services FDC services to exporters include the Export Promotion Programme, which aims to grow demand for Free State products in global markets through capacity-building workshops, the dissemination of trade leads, networking opportunities with inbound trade missions, product promotion through participation in outbound group missions and on national and international exhibitions, access to national export-incentive programmes, market access information and technical advice on exporting procedures. Property management The FDC administers a diverse property portfolio and can offer small to medium enterprises suitable premises at affordable rates. The corporation has some 253 commercial properties, 290 industrial properties and a large number of residential and vacant land for development. The corporation aims to use them to facilitate commercial and industrial activity, while assisting new investors looking for suitable premises. The FDC offers advice and guidance in terms of the following incentives: •	Subsidised rental rates. Rental holidays of up to three months. Special incentives and discounts for BEE companies or individuals. 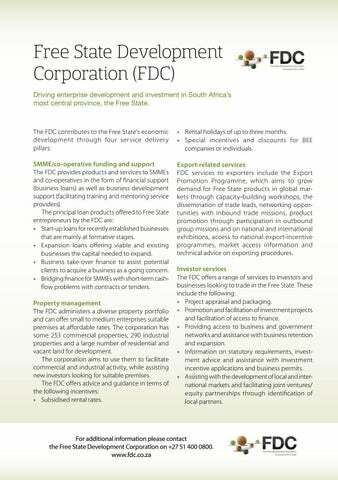 Investor services The FDC offers a range of services to investors and businesses looking to trade in the Free State. These include the following: •	Project appraisal and packaging. •	Promotion and facilitation of investment projects and facilitation of access to finance. •	Providing access to business and government networks and assistance with business retention and expansion. •	Information on statutory requirements, investment advice and assistance with investment incentive applications and business permits. •	Assisting with the development of local and international markets and facilitating joint ventures/ equity partnerships through identification of local partners.